Looks like a great event. I'd love to see all the stuff, but not a big enough nerd to deal with all the crowds and psycho fans. 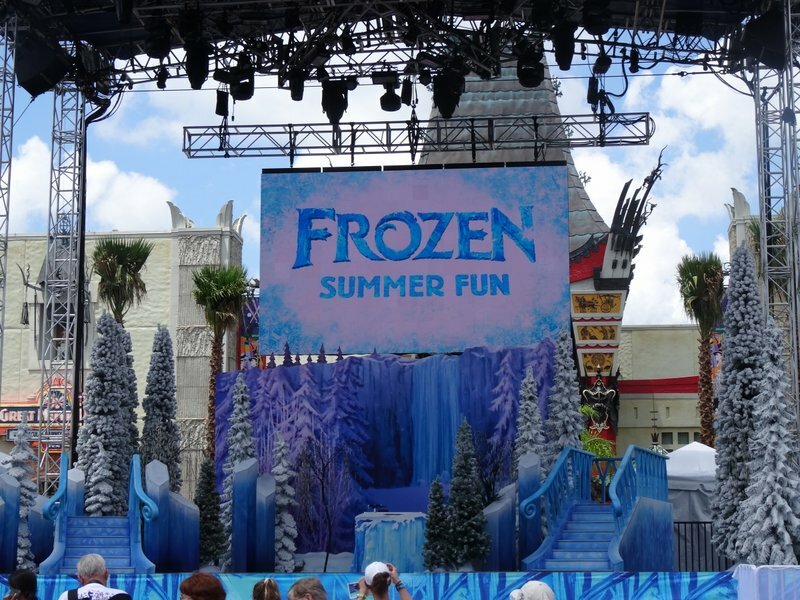 Yesterday Theme Park Review was invited to attend the first day of Frozen Summer Fun at Disney's Hollywood Studios! 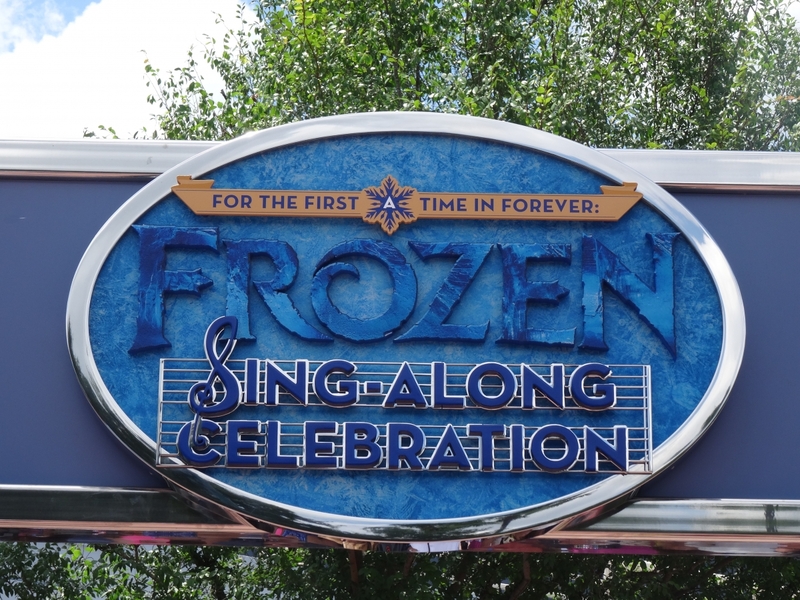 This event brings back several favorites from last year's initial Frozen programming along with some new offerings to add to a day at the park! 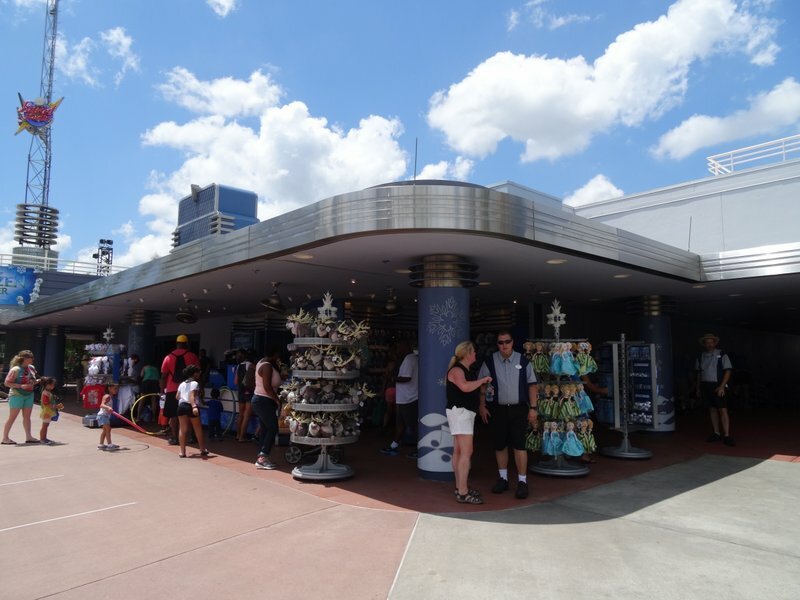 A new stage setup has debuted this year thanks to the removal of the former Sorcerer's Hat icon, with the new stage sitting approximately where the old pin trading booth under the hat was located. 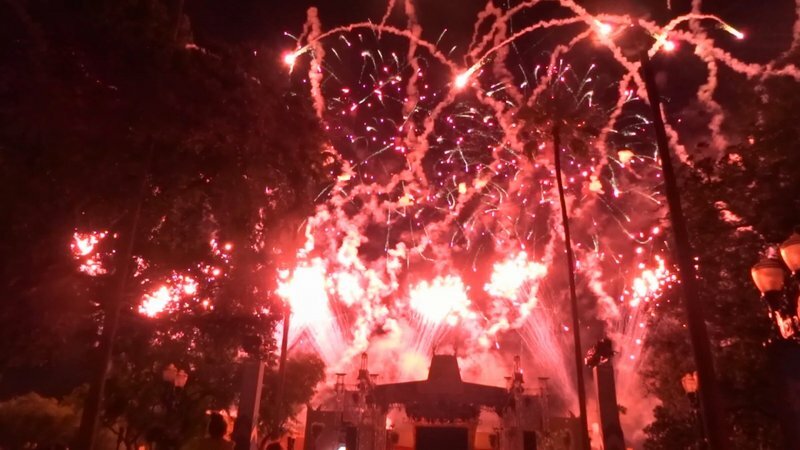 Sitting slightly closer to the Chinese Theater/The Great Movie Ride than the stage did previous when the Sorcerer's Hat was still present, there is a slight increase in space for guests directly in front of the stage to enjoy the entertainment. 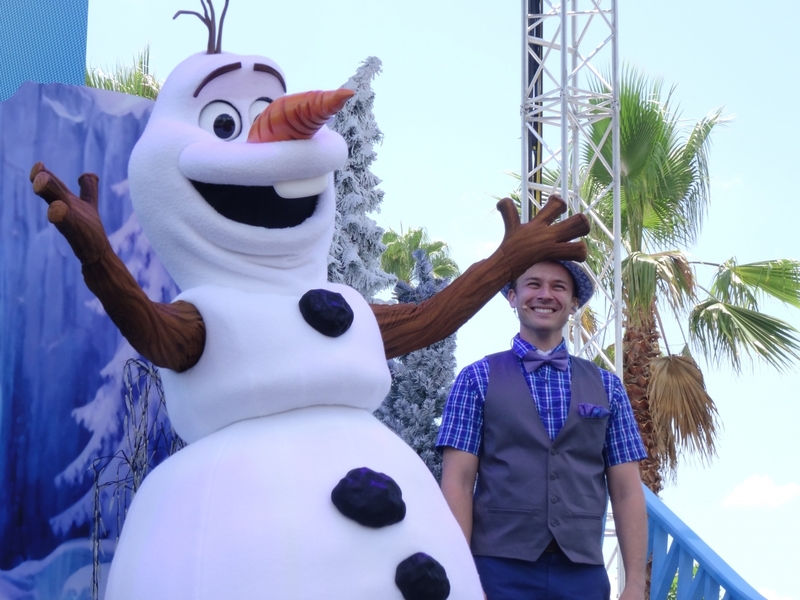 A brand new show called Olaf's Summer Cool Down debuts this year as well, featuring a newly-articulated Olaf that can blink and move his mouth as he speaks, sings and daydreams about all things warm. 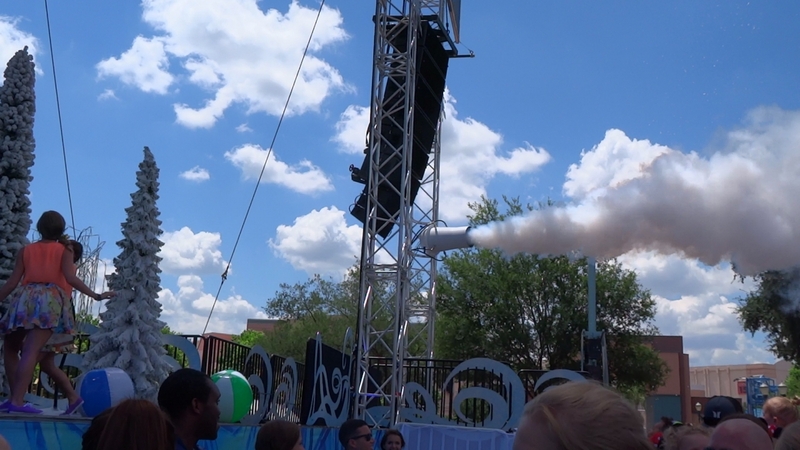 I've attached a great video from our friends at Orlando Attractions Magazine for the show. 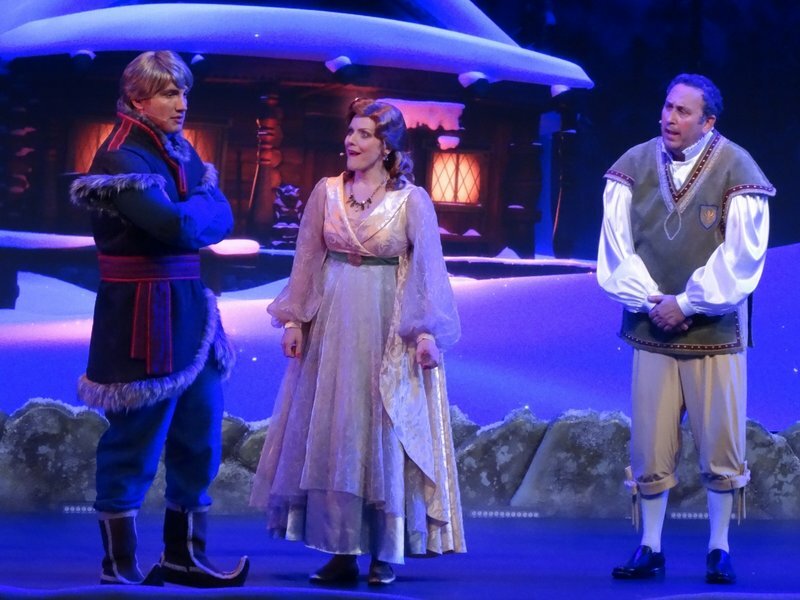 For the First Time in Forever: A "Frozen" Sing-Along Celebration has moved from its previous home in the Streets of America's Premiere Theater to the Hyperion Theater (the previous Superstar Television Theater that hosted The American Idol Experience most recently) and with this move, the show has been given a new set, new in-theater effects and a much larger seating space for more guests to be able to enjoy each show. 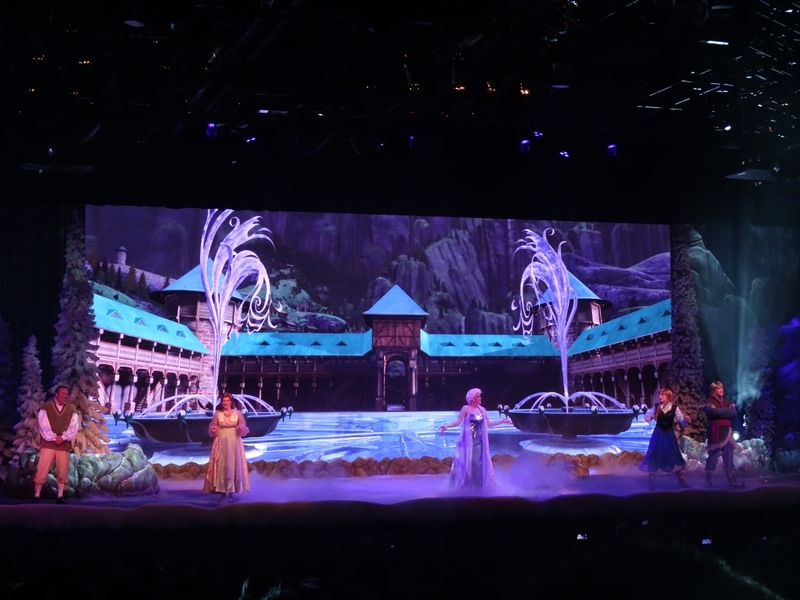 The content of the show itself is still the same super-popular show that has been running at Disney's Hollywood Studios for the past year, but the new venue makes the show feel far more permanent and the audience seemed to be loving it. And for those curious about the remnants of The American Idol Experience, the former show's stage has been entirely removed as have the former voting panels along each seat. 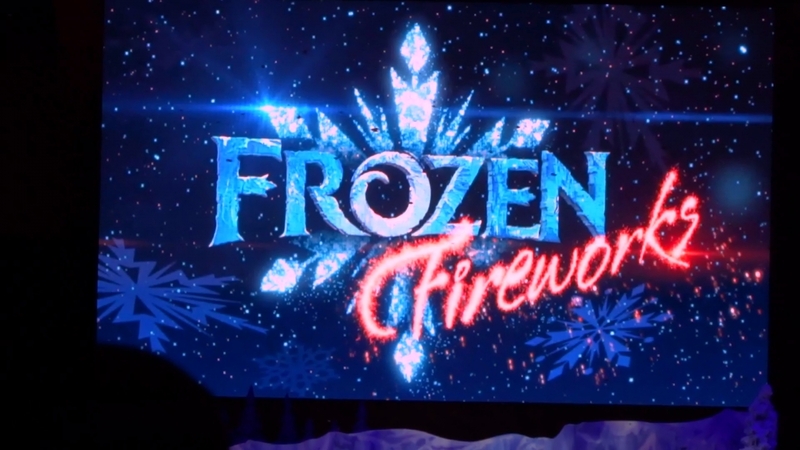 The culmination of Frozen Summer Fun at Disney's Hollywood Studios is the "Frozen" Fireworks Spectacular. 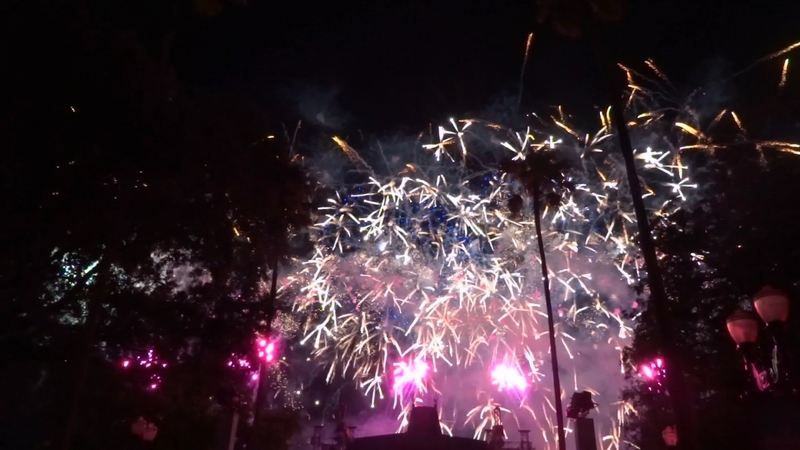 It is always a treat to see fireworks at Disney's Hollywood Studios, something that is most often reserved for special events like Frozen Summer Fun, Star Wars Weekends or major holidays like the Fourth of July or New Year's Eve. 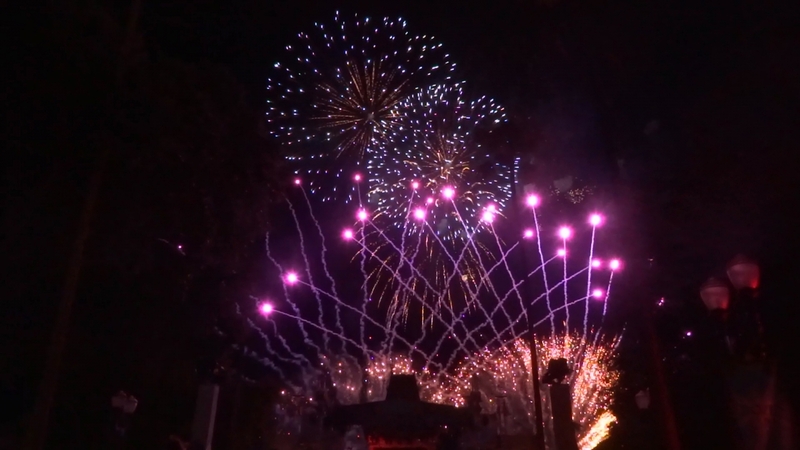 I can't say for sure if this year's fireworks spectacular is a carbon copy of last year's version, but I was thoroughly impressed by the sheer amount of pyro used during this impressive show. 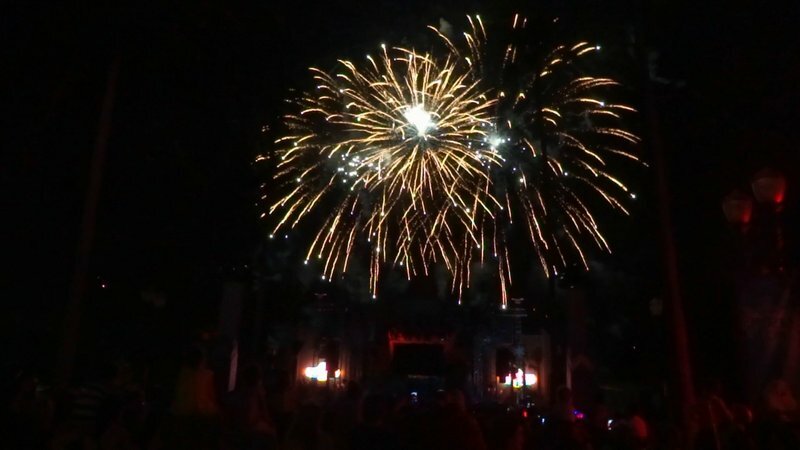 It was also nice to have the characters appear on the stage to cut between the fireworks at several points in the show. Definitely a great way to end the day at the park! 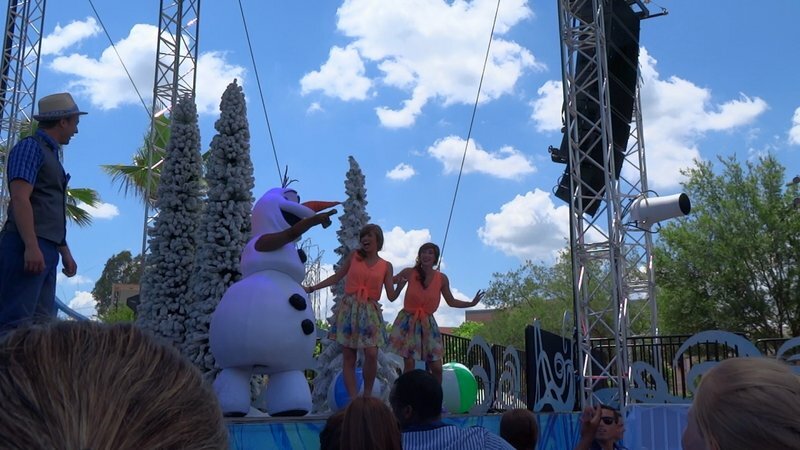 We had a great time today at Disney's Hollywood Studios for this year's version of Frozen Summer Fun! 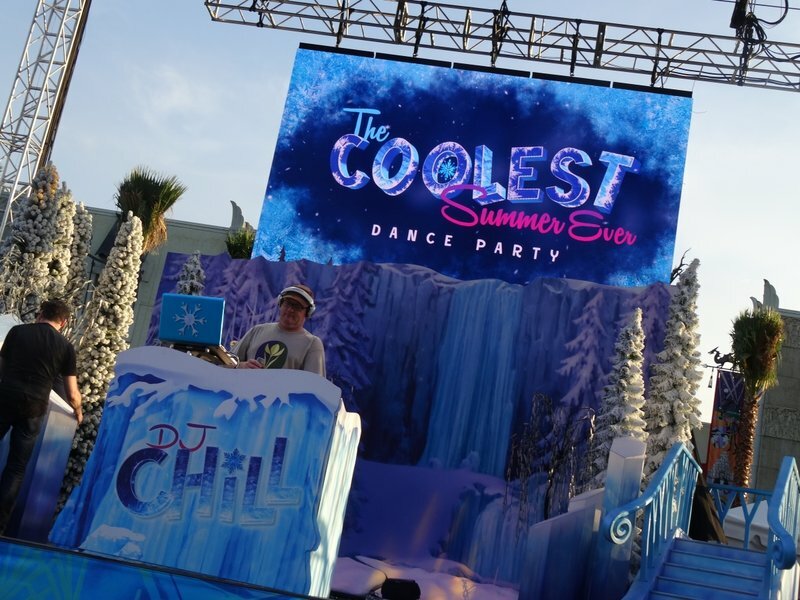 The event runs every day from now until September 7th, 2015, so be sure to check it out during your next visit to the Walt Disney World Resort! 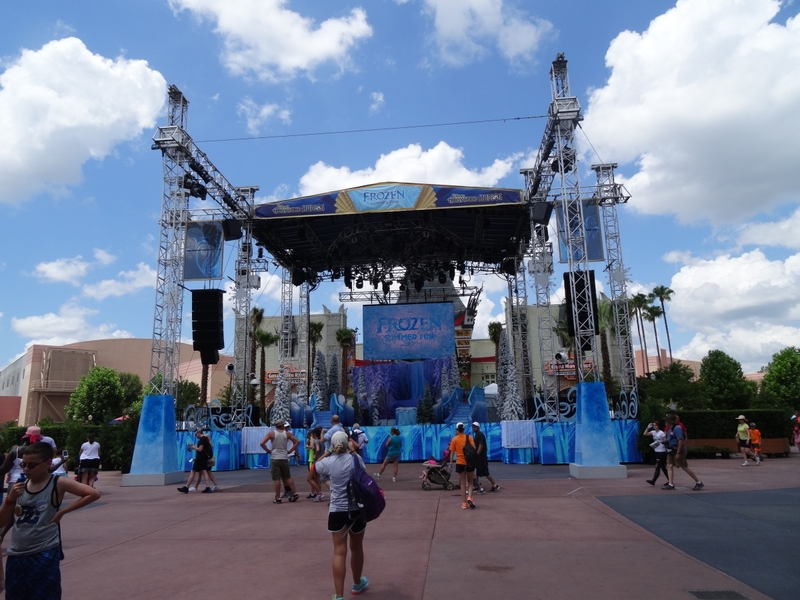 The stage setup is quite different than last year's layout which was heavily borrowed from Star Wars Weekends 2014. The show's popularity called for a larger show space and with The American Idol Experience moving out, this was a natural place to move the show. 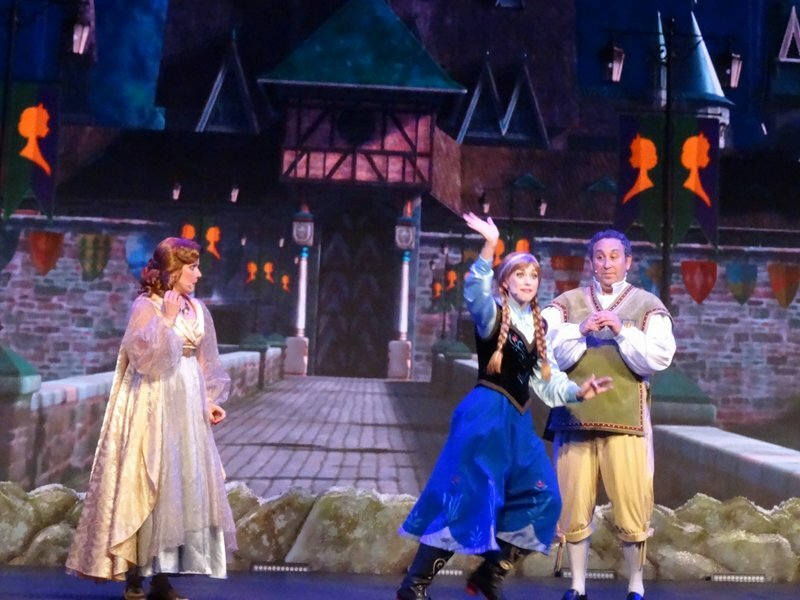 With how popular the show is and how full the theater is during each showing, it comes as no surprise that the theater hosts a huge number of performances each day. The Hyperion Theater received a slight signage upgrade to prep it for its new title and tenant. 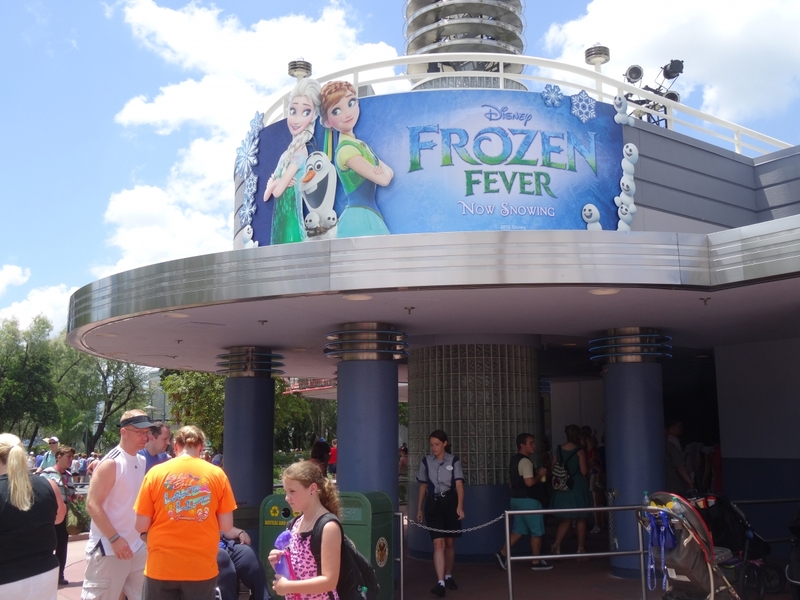 Wandering Oaken's Trading Post did not return for this year's event, but a more permanent Frozen merchandise space has been set up at the exit gift shop that was formerly used for The American Idol Experience merchandise. The ABC Sound Studio (formerly home to Star Wars Rebels: The Ultimate Guide, the Cinderella movie preview, the Maleficent movie preview, the Comedy Warehouse: Holiday Edition and before that Sounds Dangerous with Drew Carey) now hosts half hourly showings of Frozen Fever, the Frozen sequel short film that accompanied Cinderella in theaters. 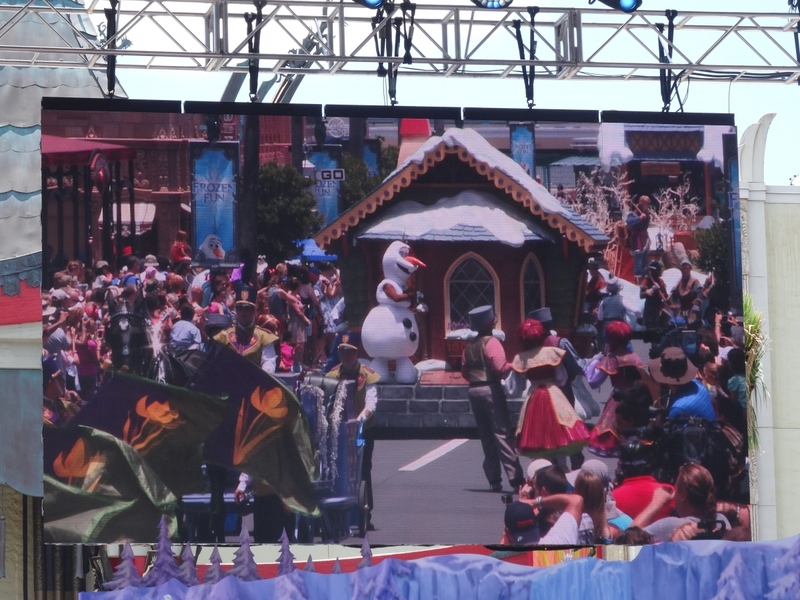 The Frozen Royal Welcome is a small procession featuring some of the residents of Arendelle to kick off the day's Frozen Summer Fun activities. 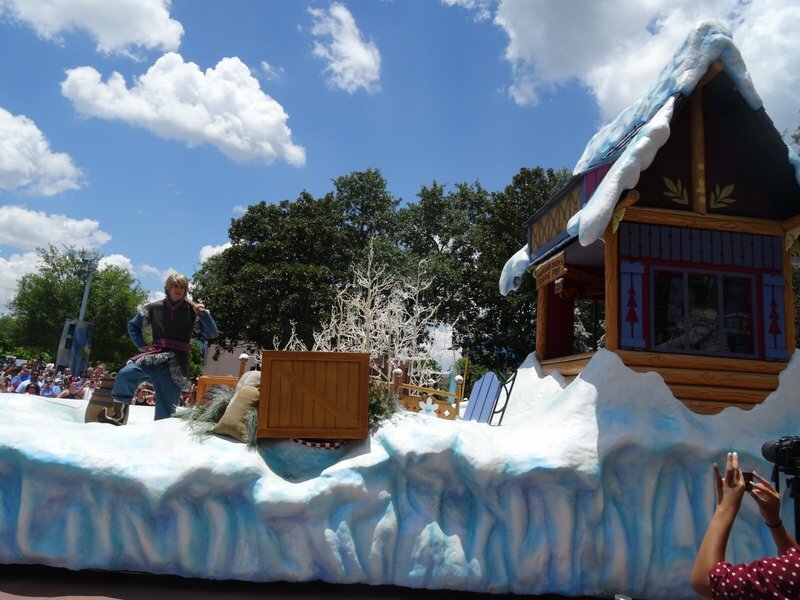 Kristoff makes an appearance on the Wandering Oaken's Trading Post float (fans of the Mickey's Very Merry Christmas Party may recognize this float from the Once Upon a Christmastime Parade). 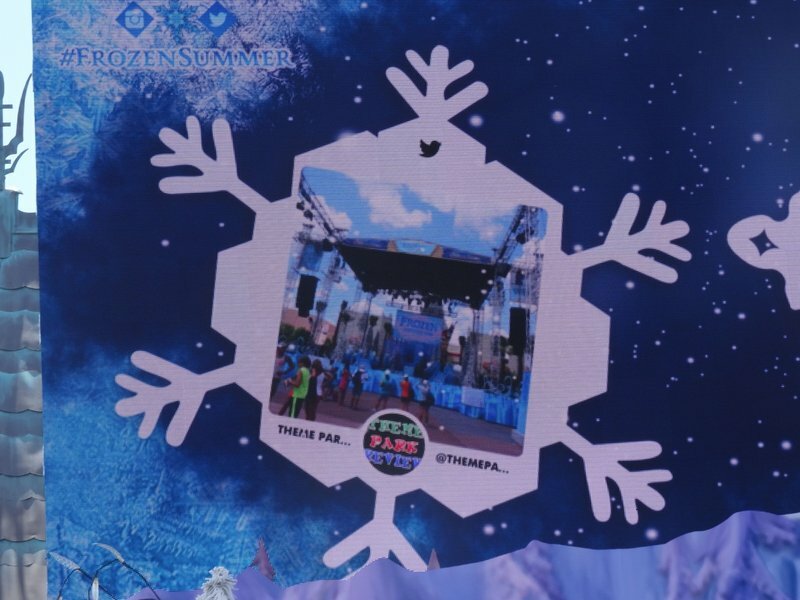 If you're tweeting in the park with #FrozenSummer your tweet may be featured on the screen for all to see! 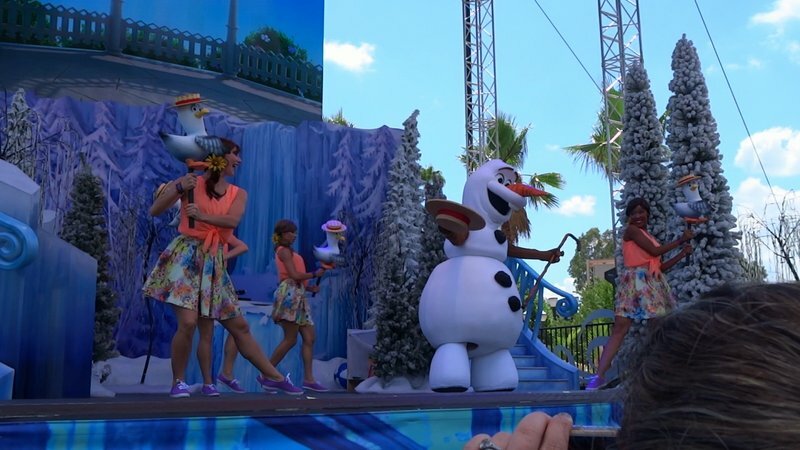 Olaf's Summer Cool Down is a new show featuring a newly-articulated Olaf character that looks fantastic! 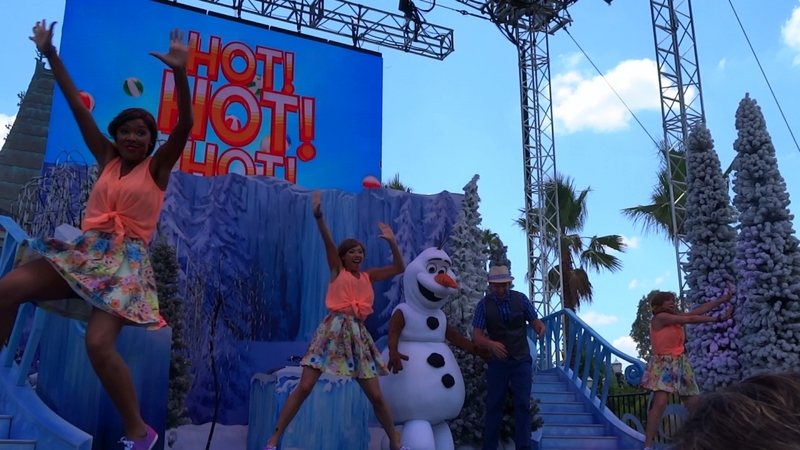 Then they do a medley of Summer-friendly songs to turn up the heat! I just like this photo. And next thing you know, you're engulfed in a blast of cold fog--it was quite refreshing! 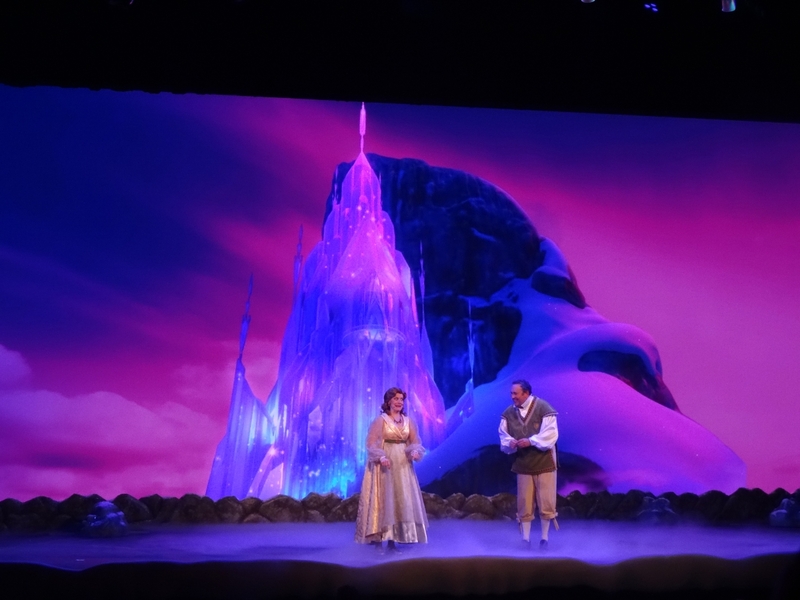 Inside of For the First Time in Forever: A "Frozen" Sing-Along Celebration, the royal historians continue their typical antics. And yes, there are sing-alongs. Everyone in the audience knows the words. 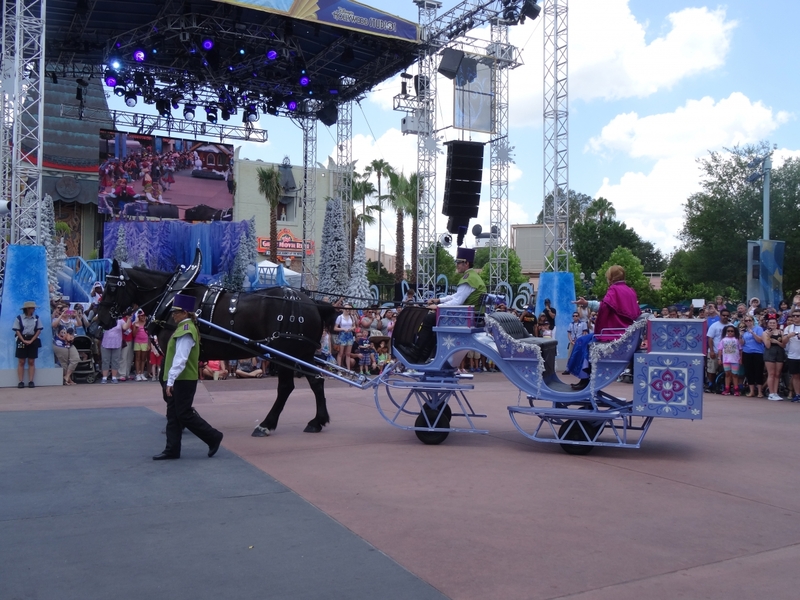 Kristoff still makes several appearances in the show. 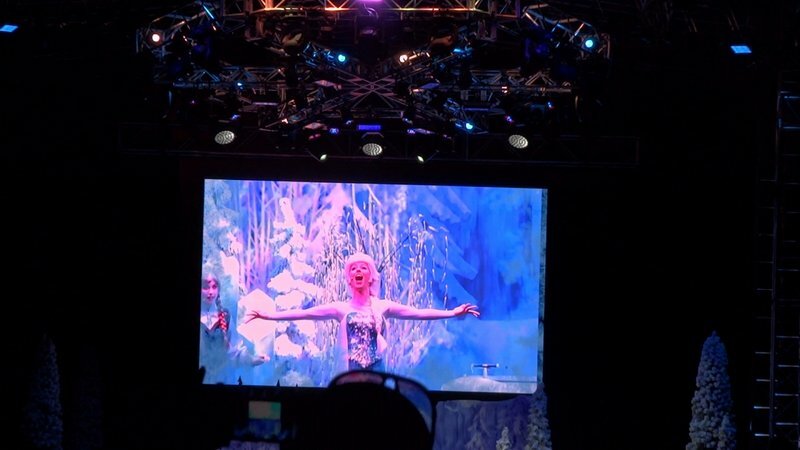 Elsa makes an entrance from a brand new set piece added for the Hyperion Theater version of the show. 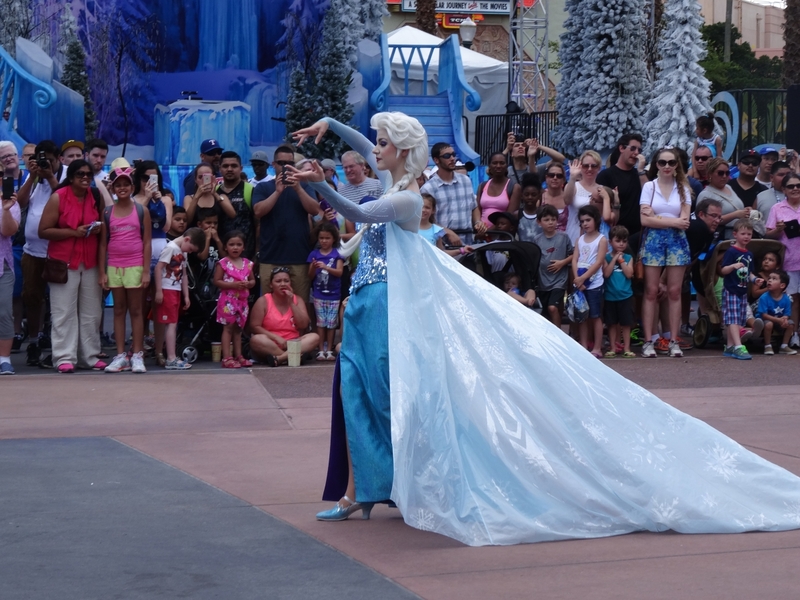 Time for the final "Let it Go" sing-along. The sides of the Hyperion Theater have added projection mapping effects that help to transform the theater throughout the show. 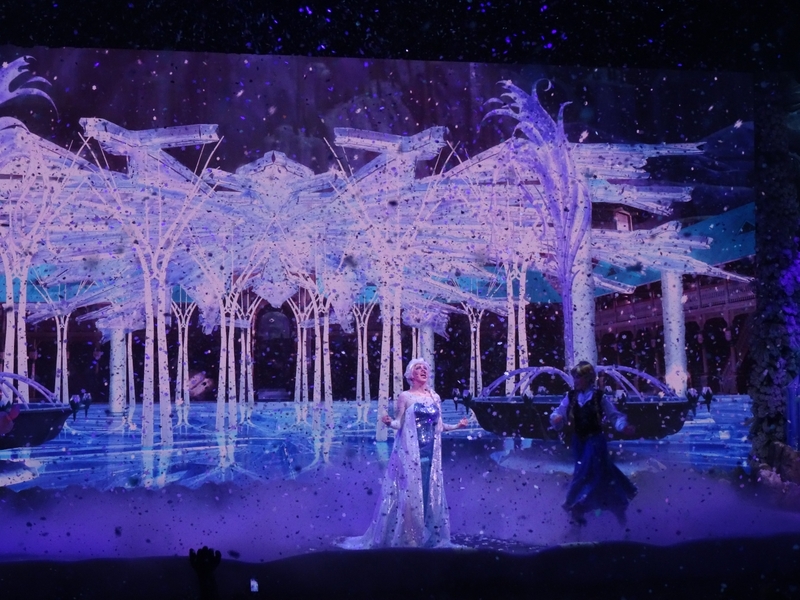 And it wouldn't be a Frozen experience without snow! These projections effects are really fun! 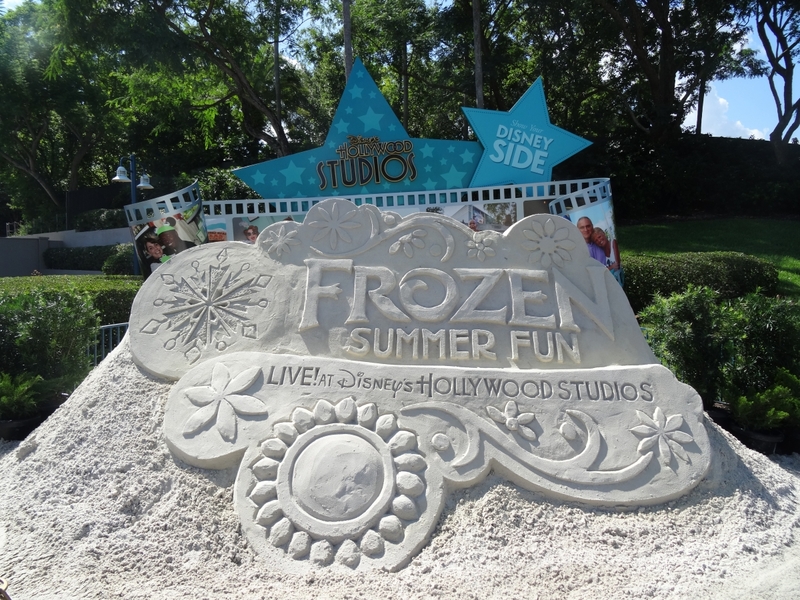 A new sand sculpture for Frozen Summer Fun has been added outside of the entrance of Disney's Hollywood Studios! DJ Elliott hosts a dance party as a pre-show for the fireworks. The "Frozen" Fireworks Spectacular begins with a little introduction by Olaf, Anna and Kristoff. There is some HUGE pyro in this show! No Sorcerer's Hat makes for a newly-interesting view! 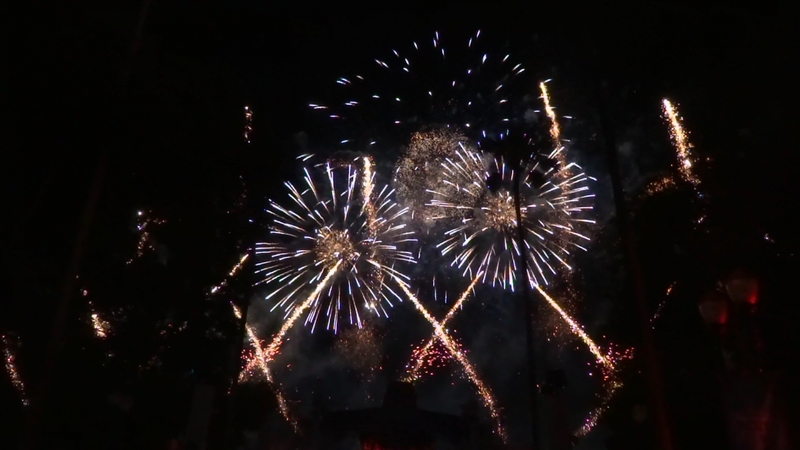 There is no shortage of fireworks in this show! Such a blast to witness! 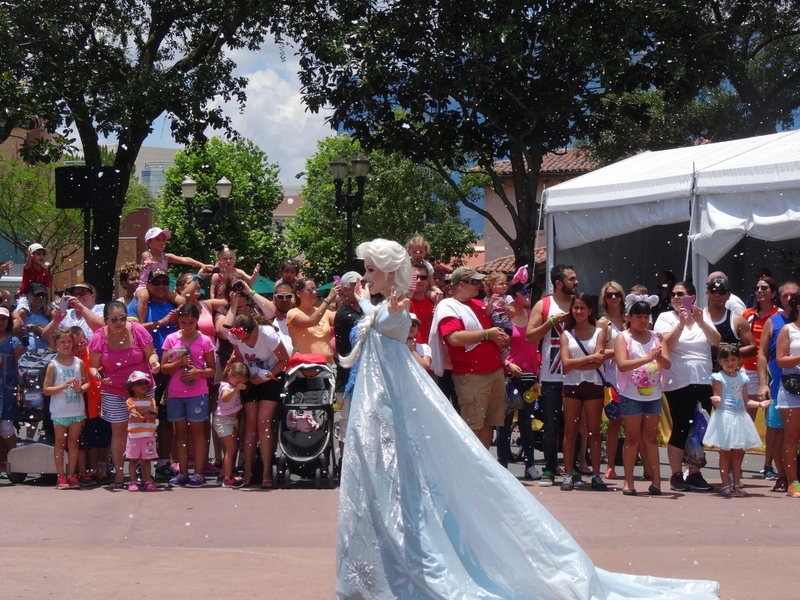 Queen Elsa comes out to sing "Let It Go" one more time as the fireworks go off. The blast takes your breath away, even from a far. Special thanks to the Walt Disney World Resort for inviting us to this exciting event! 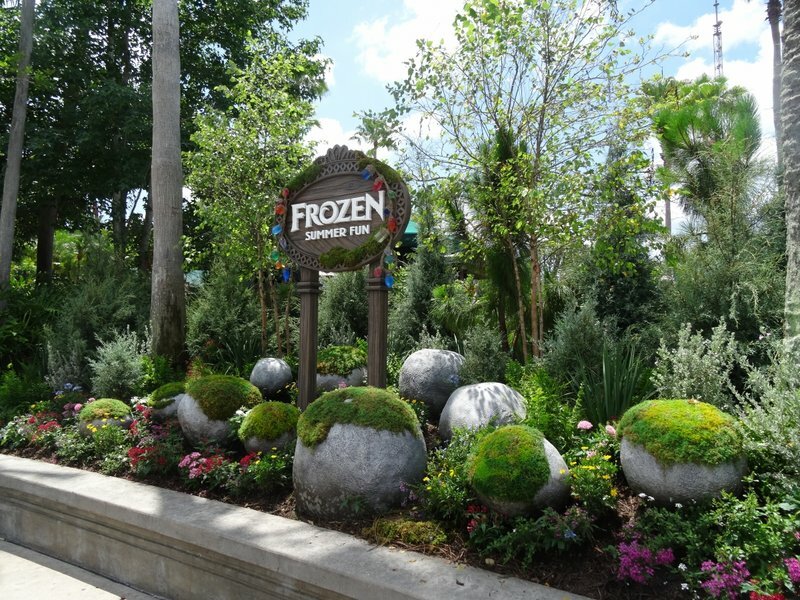 Be sure to come check Frozen Summer Fun out for yourself! But seriously, folks, great report, Adam. It definitely seems like the event is still a hit! Thanks for the report. 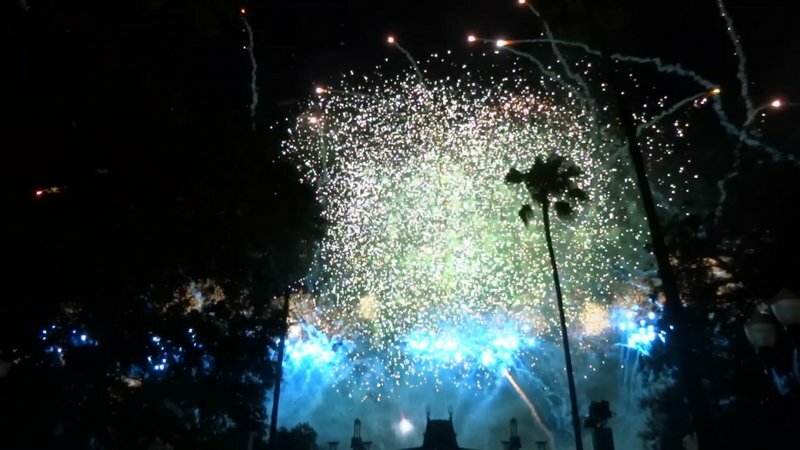 So it looks like it's the parade, the sing-a-long (in a different location) and the fireworks? Is that it or did I miss something? Great pics & report! I know with a 6 yr old princess, I'll be out there a lot this summer! Beer... It helps coasters go higher and faster! Wish I could have been there for this, looks like a great event. I watched through a couple of videos and it seems to pretty much follow in the same pattern as last years event. 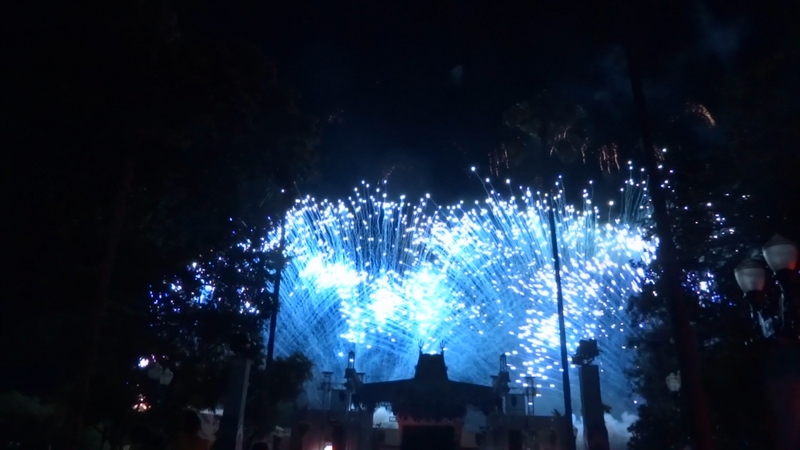 The fireworks/stageshows seems to be close to identical, with just some minor adjustments/improvements. 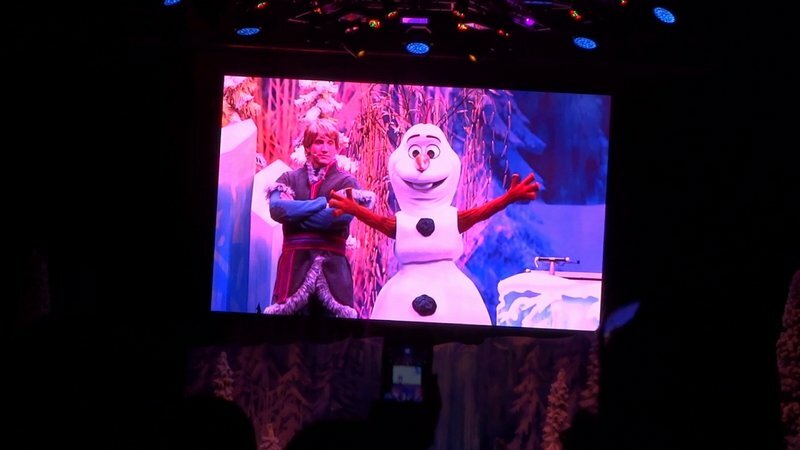 The only exception being Olaf on stage this time, I really feel that adds to the show compared to just having him on screen. I wasn't sure about the costume after just seeing it on pictures, but after watching the videos I've come to the conclusion that it works really well. 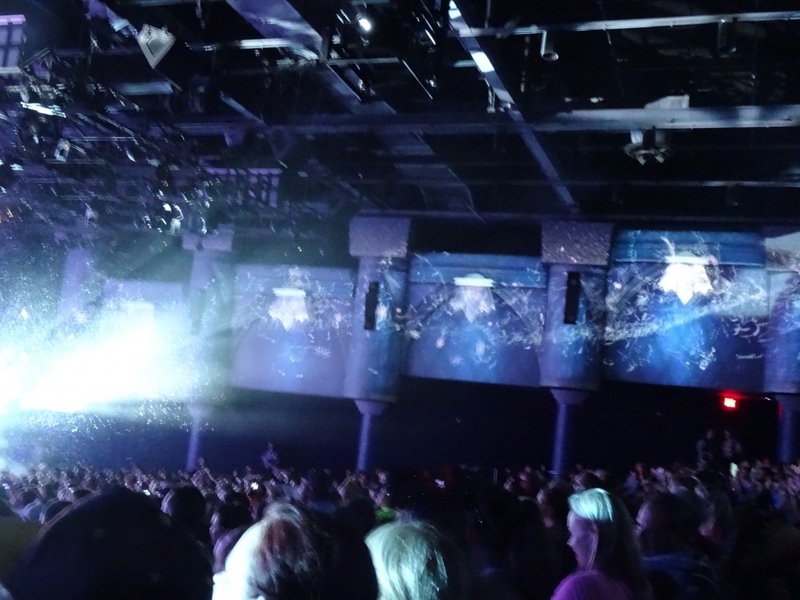 Oh, and I love the projection mapping in the sing-a-long show! 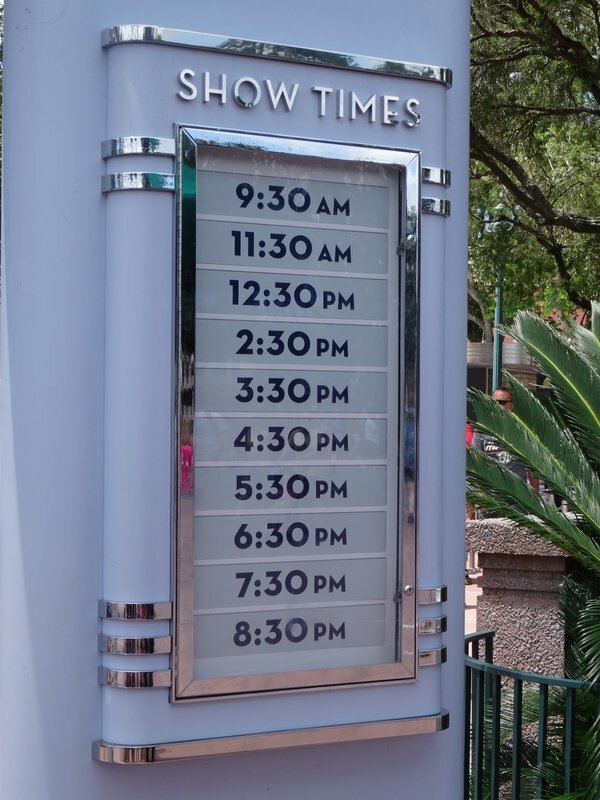 I stand by my statement about Disney World for my first visit this year. Their design philosophy has got to be something like "Just how much project mapping onto things can we do?". Its not a bad thing at all to go that route in fact I believe its the complete opposite, its AWESOME especially when Frozen themed! 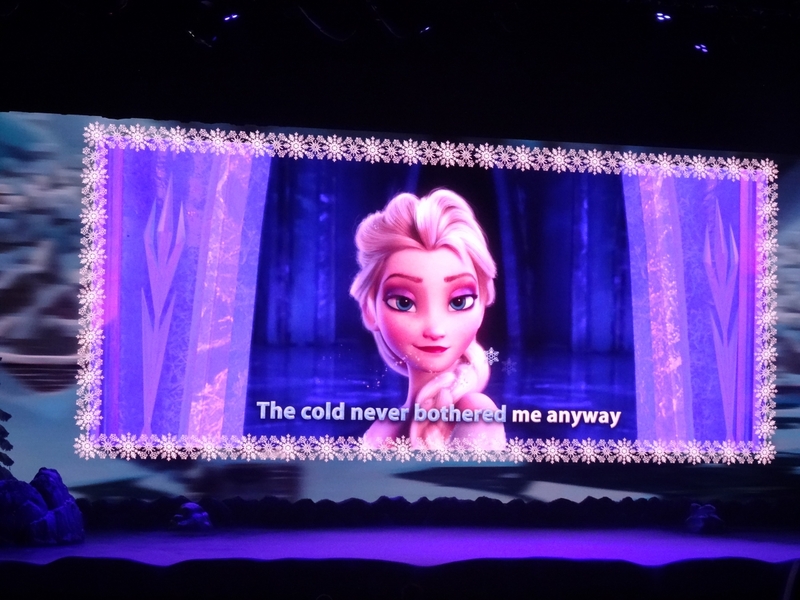 That is also a good use of the Frozen short film for that theater. 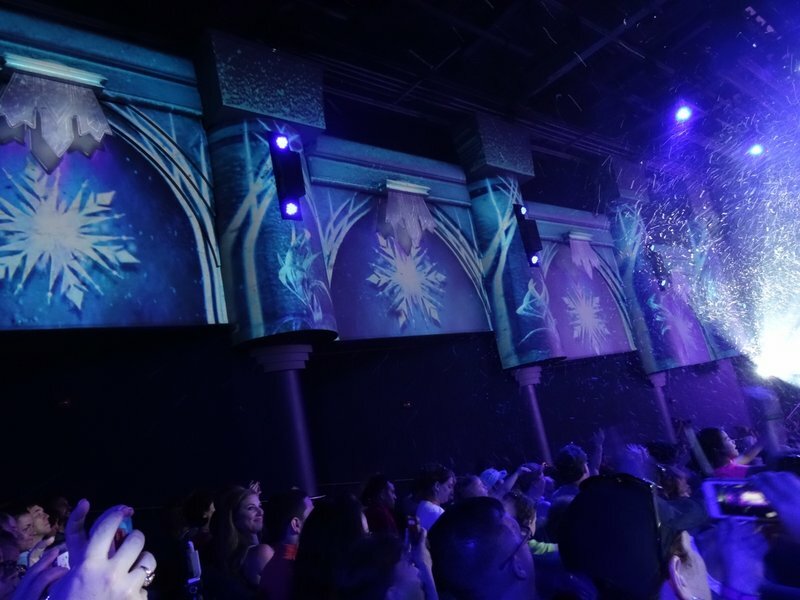 I hope that Disneyland uses the Frozen film over here in the Magic Eye theater this year, although I suspect it will be a dark venue most of the summer until they are ready to promote Star Wars. 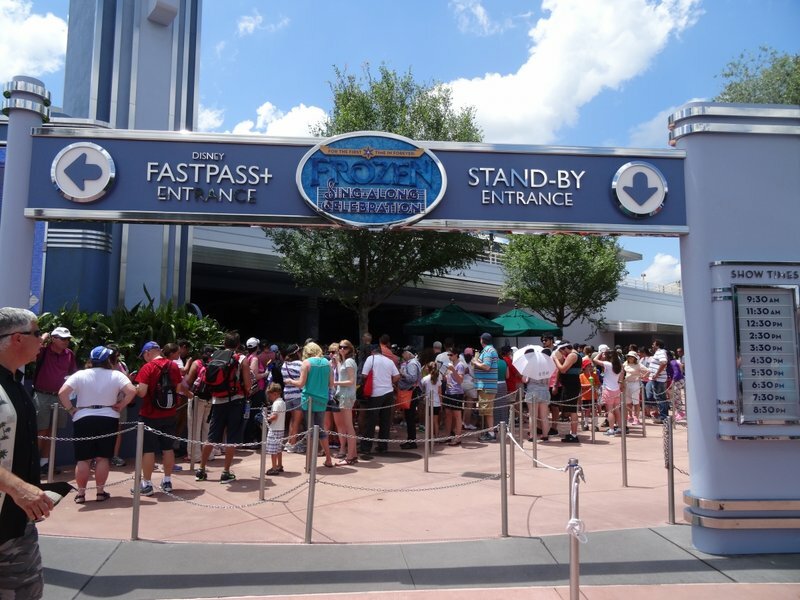 StealthFan wrote: I stand by my statement about Disney World for my first visit this year. Their design philosophy has got to be something like "Just how much project mapping onto things can we do?". Its not a bad thing at all to go that route in fact I believe its the complete opposite, its AWESOME especially when Frozen themed! 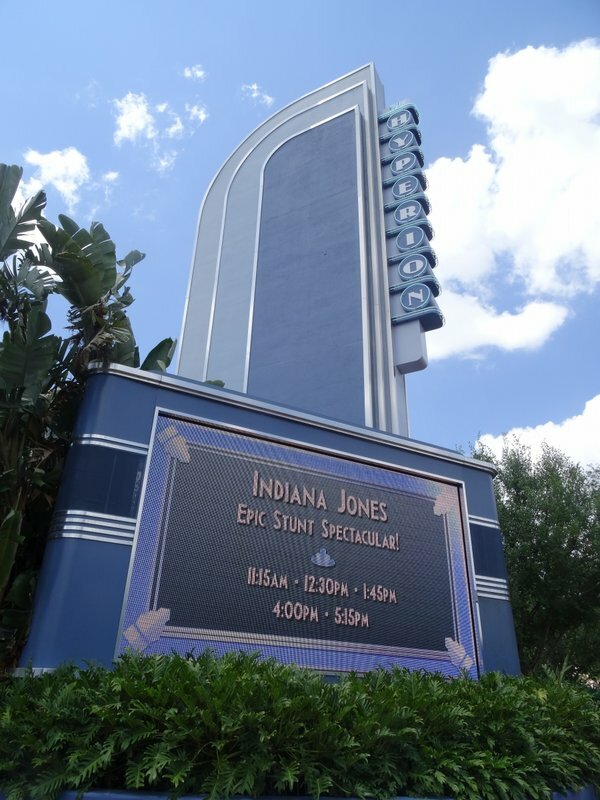 The Great Movie Ride, which transports Disney’s Hollywood Studios guests through film history, has been updated with some new interior and exterior enhancements thanks to a new relationship with Turner Classic Movies. 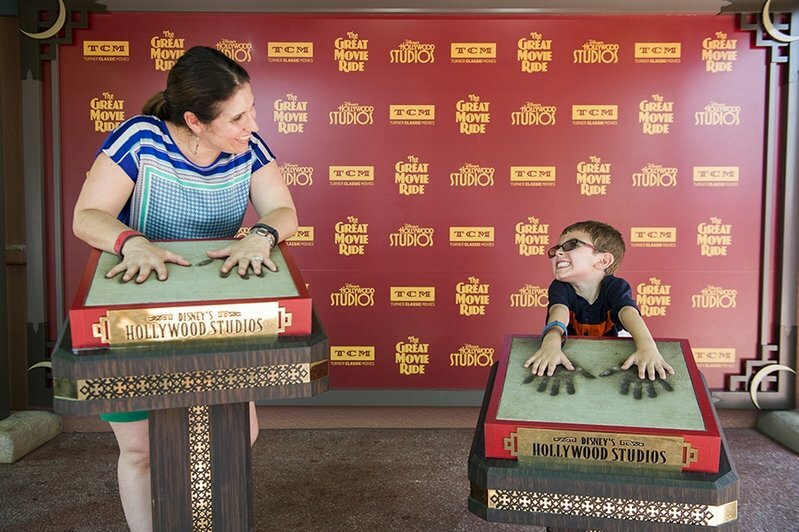 Guests visiting Disney’s Hollywood Studios can now enjoy an all-new photo opportunity that allows them to walk the red carpet and “cement” their handprints outside our Chinese Theatre. (Other enhancements inside include new digital movie posters in the queue (watch carefully to see the classic poster images move). 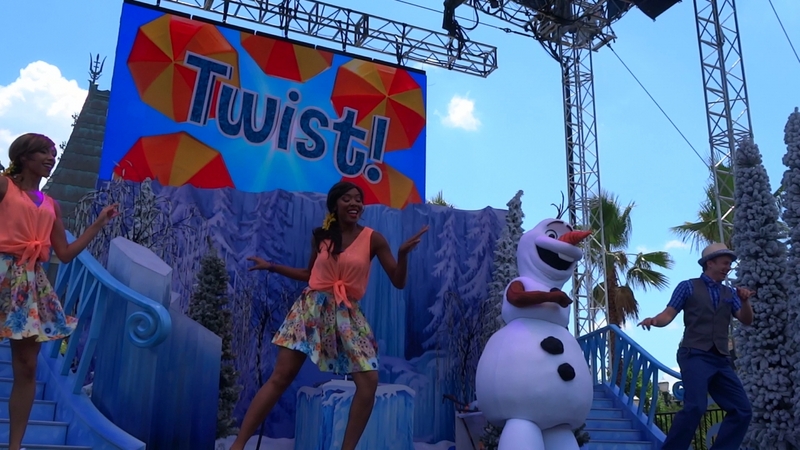 A few new clips will be added into the attraction’s finale montage later this summer. Guests will also hear new audio components during the tour from Robert Osbourne, actor and Turner Classic Movies film historian. 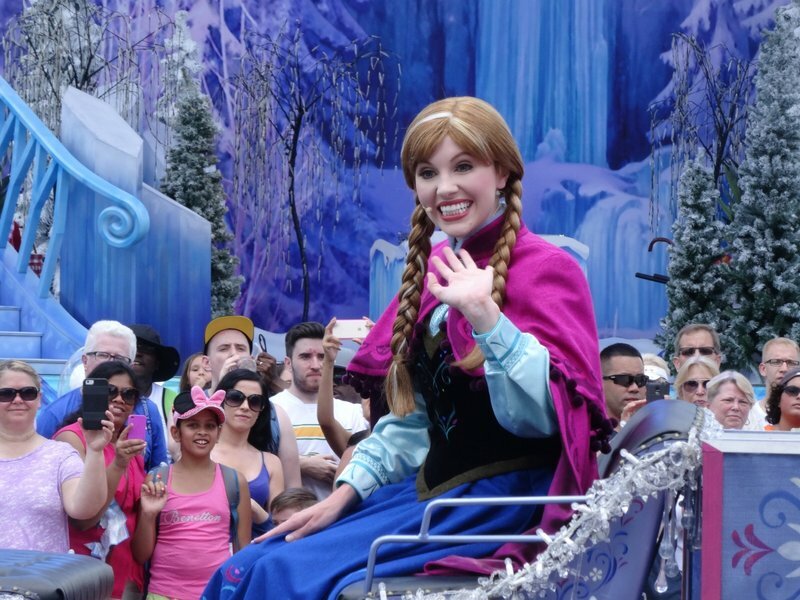 The enhanced narration will assist attraction tour guides in leading guests from famous scene to famous scene, layering in more fun movie facts. By the way, if you’re a huge fan of Disney films, you’ll want to check out “Treasures from the Disney Vault,” which airs on Turner Classic Movies July 2.